Let's enjoy a fun evening in great company at Baywatch @ Jen. 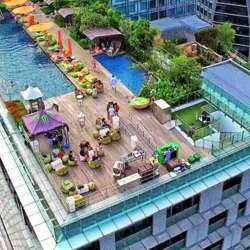 With amazing views of the Singapore skyline, this rooftop pool deck is the crown jewel of Hotel Jen Orchardgateway. Nearest MRT is Somerset. Albatross members will be charged only $5 entrance to this event. All registered members will get a welcome drink token, and it must be claimed before 22:00.